Overwhelmed by progress reports and IEP’s? We’ve all been there! 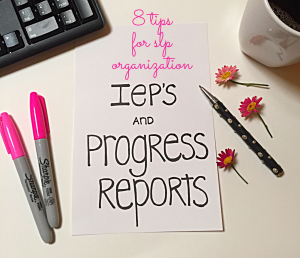 Having 70 progress reports and four IEP’s due by Friday can make even the most seasoned SLP want to hide under her desk and scroll through her Instagram feed (where everyone’s desk looks beautiful and organized). I can’t make it disappear but, I can share some organizing tips that may save you some time. I wrote this especially for the new SLP but tried to include a little something for all school SLP’s. Schedule Everything. Write all progress report due dates for the school year in your calendar. Then go backwards and schedule when you will write the reports. Make an appointment with yourself. Figure out what will work for you. I would rather eat a spider than sit and do them all at once. I prefer working in smaller increments of time and grouping. For example, I provide therapy to a functional skills classroom as a group; so I write all of those student’s progress reports in one sitting. I spread the report writing over a week or two, scheduling 30 to 60 minute intervals. Take good data. Here is the jewel. If you take the data that is easily accessible, your progress reports will be so much more manageable. You can look at your most recent data and transfer the information easily. No guesswork, no digging for lost papers. Go to Teachers Pay Teachers and find a data sheet that works for you. I keep my group data on one or two data sheets for each group. I don’t write my progress reports in ABC order like I used to, too much jumping around. Schedule IEP Preparation time. At my school we have a master IEP calendar that is created at the beginning of the year. Write all of those meeting dates in your planner. (I know that may seem obvious but it’s important to have it in your own planner). Now mark the date one week prior (or two if you’re really organized) for each IEP’s preparation time. If it is an IEP for a student that is receiving speech services and no other services, leave extra time because you are creating the whole IEP. During this preparation time you can pull the student out of class for a quick screen/review if necessary. Review previous assessment scores. Review all of that great data you have because you followed Tip #2. With this gathering of information you can write meaningful, evidence-based goals for the coming year. Ideally, you chat with the teacher(s) before the meeting, but sometimes that doesn’t happen. I always leave a little wiggle room for discussion during the meeting. I like to hear how the student is progressing in the classroom and in the resource room if applicable. If there is a specific area where a student is really struggling then I can add an additional goal. Use an IEP checklist. If you are a new SLP (or a busy one), make an IEP checklist for yourself. I have a checklist of all the areas that I need to complete on the IEP’s that I’m not the main provider for. This includes present level, accommodations, service minutes, and all of the various boxes that I need to check. I have a separate checklist for SLI only students. It’s so easy to forget something, this is just a way to avoid those errors. Keep a goal bank. This way you don’t have to keep reinventing the wheel. I have my goal bank divided by grade level and areas; articulation, vocabulary, syntax, pragmatics, and stuttering. I also have a functional skills section for my special needs students. I add to it as I create new goals. I keep mine in Evernote (Tip #6). Use Evernote as a Digi-file cabinet. Evernote is amazing! This digital workspace keeps me organized (and it’s FREE). Evernote is organize by Notebooks, which are like file cabinet drawers. I have a notebook for each school year. Within the Notebooks, your create “notes”. These are like the files. I add present level information for each student as a separate “note”. I don’t use birthdates or last names, so this is HIPPA correct. Each note is titled “studentname IEP date”. When completed, I cut and paste into the IEP. The beauty of this is that I have last year’s present levels at my fingertips for comparison and for cutting and pasting. Also, Evernote is mobile friendly and automatically synced to all of your devices. I also use Evernote for speech language evaluation reports (again, not including birthdates or last names), subjects (like Autism, AAC, Audiology, ASHA). It has been a lifesaver for me! Make templates. Anytime you have to do a task multiple times, like progress reports and IEP’s, it’s time to have a system in place. I have a progress report template that includes present level data, (percentage, cuing, prompting, level, setting), area of improvement and area to work on for mastery. I also have one for Present Level for IEP’s which includes: number of service minutes, areas addressed (articulation, expressive and receptive language, pragmatics, fluency), something positive about the student, and overall areas of strength. Hopefully, if you use one or all of these seven tips your lwork life will be more organized and a little less stressful. Is there one tip that really speaks to you? If so, give it a try this week. Feel free to reach out to me in the comments. Thanks for reading. No matter how seasoned, we all get to parts of the year when we wonder how it will ever get done. Thanks for the terrific tips! I need to try Evernote! Great tips. Thanks Lisette. I highly recommend Evernote, keeps me organized. Thanks @speechsprouts! These are great tips. I haven’t tried Evernote but have been wanting to check it out! Glad you liked the tips Lauren @busybeespech. I am going to write a separate post on Evernote, maybe even do a YouTube tutorial. I do all of those, except use Evernote for speech. Templates have been my biggest lifesaver. I have one for each test I give (interpretation of scores, test description, etc), current levels, goals, etc. Where would we be without our templates Kayla? I am going to do a whole post on Evernote, I love it that much.